Companies like Uber and Lyft make any car owner a potential paid chauffeur, and their services are increasingly widespread in American cities. 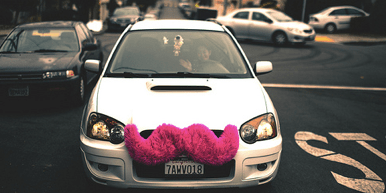 Companies like Uber and Lyft have been dubbing their services “ridesharing.” These companies contract with drivers who can make money by offering rides. Jason Pavluchuk from the Association for Commuter Transportation argued that calling these services “rideshare” made it harder to advocate for other models that more aptly deserve the term, like carpool and vanpool services where people actually ride together. Uber and Lyft are really new variants on taxi service. They let people use a car they might already own (though Uber is also offering loans to drivers to get new cars), but they are still doing it as a job. If you use such a service, you’re not sharing someone’s car; you’re paying them to give you a ride. Other companies like Sidecar have envisioned a model where people already driving from one place to another offer rides to someone who happens to be going the same way. That’s a little bit more “sharing” than the app-based taxi-like services. GGW is asking readers to weigh in on what these services should be called. If not “ride-share,” then what? Elsewhere on the Network today: Rights of Way reports that Maine DOT still needs to get the hang of accommodating pedestrians and cyclists during construction projects. Naked City writes that North Carolina lawmakers have figured out a new way to potentially derail proposed passenger rail service between Chapel Hill, Raleigh, and Durham. And Strong Towns weighs in on the debate about whether a new sales tax to support transportation projects is the right solution for Missouri. Cities can start reducing parking at destinations like airports, concert venues, bars and restaurants and in downtown areas, according to a new University of Colorado study. The latest line from anti-transit types is that ride-hailing apps like Uber and Lyft are going to make fixed-route bus or rail service obsolete. If you find yourself arguing with someone about why transit is essential, a new fact sheet from TransitCenter can help.